" Manchester International School is providing ample amount of opportunity for the ICT students to carry out their studies in the field of computing. Students are given lots of mini projects in the form of discussions, seminars, presentations etc, to build their knowledge in the field of computer science. Students are given more hands-on experience in the computer labs to write source codes to create small application software. Manchester International School aim is to make their students so creative in carrying out their work which will make them the leaders of tomorrow in the information technology arena." - Vineeth Nair, ICT Teacher.
" Manchester International School is a potential school with good infrastructure and amenities to make students fit for today’s real world challenges in terms of academics and sports. Really, we teachers are very happy to work in one of the best international schools in India." - Ashath, Chemistry Teacher.
" Manchester International School is an educational institution which not only provides opportunities for students but also for teachers to improve their skill. Manchester International School gives emphasis to education in all the aspects." - Ponkala A, English Teacher. "A School with good infrastructure facilities and a place which truly values the student’s opinion, Manchester International School has an ability to find and appreciate their talents and help them to achieve their goals and ambition. We teachers are so proud that, Manchester International School is awarded India’s best school (Jury`s Choice Award) by Education today in their School Rankings 2016" - S.N Abhuthahir, Business Teacher.
" Manchester International School follows Cambridge curriculum which allows students and teachers to learn much more collaborative rather than dictatorial. This curriculum has no prescribed textbooks and a lot of freedom in learning, this sets a platform for the students who plan to pursue under graduation abroad. This school focuses more on developing critical thinking, analytical & investigative skills, abilities, problem solving techniques, team work, independent respect and other moral values. It also provides students an opportunity to select course according to their interest in the subject of science, humanities, language and mathematics." - Ashok Kumar, Mathematics Teacher.
" Manchester International School does all it can to ensure the prompt availability of the infrastructure and materials both for the staff and students to conduct a harmonious and smooth flowing academic session. Students cherish each day spent here and feel glad to interact with their mentors." - Poornima, English Teacher.
" Manchester International School is a palatial school with suitable infrastructure empowering students to be independent for their holistic development. As a teacher I am so proud that Manchester International School is ranked No. 1 school in Tamil Nadu by Education World in their School Rankings 2016" - Sweeta Victor, Economics Teacher. "The Manchester International School school follows Cambridge curriculum which helps the students to bring their potential and explore the world with their scientific skills gained through scientific enquiry. It helps the students to become self-confident. I am so happy to work in one of the best International Schools in India." -P. Shanmugapriya, Biology Teacher. “ Manchester International School has given me an excellent path to prove as a teacher. My coordinators are friendly and share their experienced knowledge with me .This encourages me to give the students the skills I have secured. In our school, Tamil is been given great respect and honour .I feel proud to be a part in this Manchester family.” Mrs. V. Meenakshi, Tamil Teacher. “ Manchester International School is really a good school in coimbatore, India, not only for children but also for teachers. It has good infrastructure and well trained teachers to gain knowledge. Children really enjoy learning through hands-on techniques and through practical experience. I am happy to work as a teacher and be a part of Manchester International School team. As I’m new to the IB curriculum as a teacher, I have also gained a lot of knowledge while teaching. 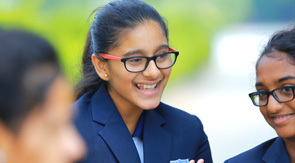 The special thing is Manchester International School offers all the curriculum, CBSE, IGCSE, AS & A Levels, IB PYP & DP ”- Ms. J. Devi Keerthana, Grade 1A IB-PYP Home Room Teacher. “ Manchester International School is really good place for the children to learn the multiple way of education. It’s the place where we can improve our knowledge through various activities. As a teacher, by using innovative methods we can upgrade our self and gain knowledge. It’s really a different experience to teach IB curriculum. I am glad to work in this institute as a teacher and also a learner." - Mrs. S. Baby Rani, Grade 1B, IB-PYP Home Room Teacher. “I am grateful to be part of Manchester International School team. As a teacher , I have gained knowledge about the IB teaching methodologies .We are having a friendly and co- operative environment to work with. We have been given training and guided by our co-coordinators for constant improvements. We are still molding ourselves to perform better and are given independence to implement our teaching methods.”- Mrs. Sasiprabha .S, Grade 1C , IB-PYP Home Room Teacher. “It gives me immense pleasure and privilege to be a part of the Manchester International School team. As a teacher, I have groomed with the immense curriculum knowledge received from Manchester International School . I feel independent in teaching my students, the subjects, following the proper IB methodology. I am able to create an enthusiastic environment in the classroom with love and care given to me.” - Mrs. Sathya Suresh, Grade 2 A, IB-PYP Home Room Teacher. “I love the atmosphere of Manchester International School. It always gives me a positive feel. I love the peer work and have learned many new things. My coordinators help me a lot with my work. They are very friendly. I feel proud of being a part of Manchester International School , which has given a good start to my career. In my childhood days I always wanted to study in the institution like Manchester International School ." -Mrs. C. Dhanya, Grade 2B, IB-PYP Home Room Teacher. “Being a fresher to this job as a Teacher I have learned many new things which have groomed me to a different extent. Day to day I am gaining more knowledge which I needed the most. I feel that I have taken the right decision to start my career in Manchester International School. Feeling proud to be a part of Manchester International School - the best school in India.” - Mrs. G.Nivedha Grade 2C, IB-PYP Home Room Teacher. "The school has a really good, really happy atmosphere. There’s a nice buzz around the playground and older children mentor the younger children, showing them how to play positively. Children are really happy here. I believe the happiness is the base of all success and MIS is proving it, I would like to say that Manchester is one of the best cambridge schools in India"